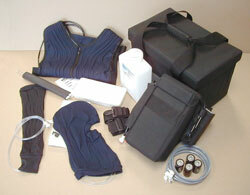 The CORETECH™ Distributor Kit is a compilation of integral items from the CORETECH product line. This kit provides DTI distributors with the tools to effectively demonstrate and provide familiarization training on a variety of CORETECH™ Body Temperature Control Systems. A Distributor Kit includes one CD2 Cooler with a spare ice bottle, one TUBEsuit™ Vest, a Convincer Sleeve, a repair kit, a hood, a 4.5' extension hose, a laundry bag, a sample insulated water supply hose, and an instruction and maintenance manual; all packaged in a convenient carry bag. DTI is committed to meeting and surpassing our customer's needs by providing quality CORETECH™ Body Temperature Control Systems. DTI (Delta Temax Inc.), 320 Boundary Road, Pembroke, ON K8A 6W5. Tel: 613-735-3996; Fax: 613-735-3814.